The exhibition will run between the 10th and the 13th of May. 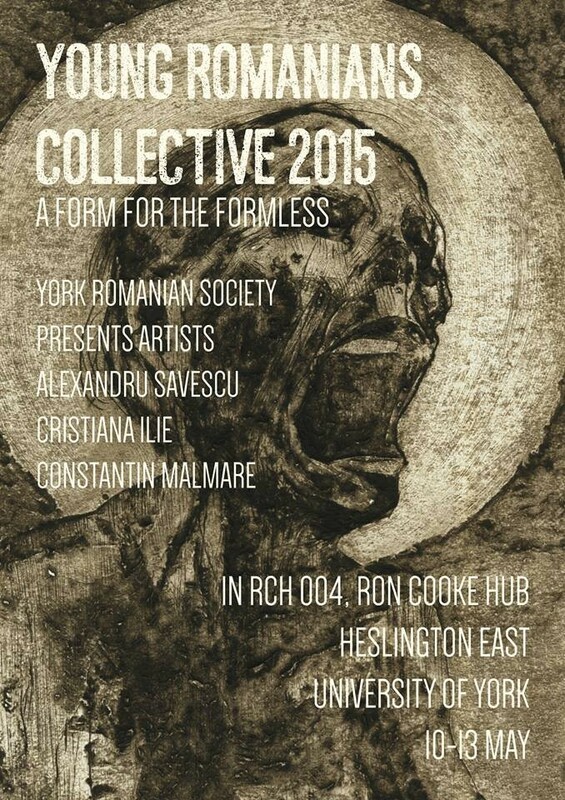 York Romanian Society proudly presents Young Romanians Collective 2015: A Form for the Formless. Working with a variety of materials and methods, three young Romanian artists from Coventry will be exhibited in the University of York's Heslington East Campus. Young Romanians Collective is a project inaugurated by the York Romanian Society in an attempt to unite the creative forces of Romanian students studying and working in the United Kingdom. In what we hope will be a recurring annual event involving both institutions and student bodies, Young Romanians Collective aims to achieve regional and international cultural cross-pollination. The first instalment will feature Alexandru Savescu, Cristiana Ilie and Constantin Malmare, students at Coventry University's School of Art and Design, and will be curated by the Society's own Liviu Tanasoaica. This year's artists will explore the concept of formless. First theorised by Georges Bataille, and more recently discussed at length by Rosalind Krauss and Yves Alain Bois. Krauss and Bois recovered a set of strategies from Bataille's writings, through which categories used to critically engage art - such as Form, Meaning, the Subject and Language - can be knocked off of their pedestals. This dethronement is necessary in order to reveal what has been repressed through the categories' hermeneutical operations. The goal of the exhibition is that of exploring the varied means through which images allow formless matter to surface graphically; it will attempt to test some of the premises of Krauss and Bois' theory of the formless.